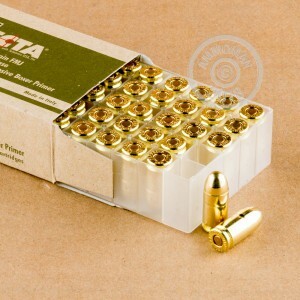 Fiocchi Perfecta 380 ACP ammo is a great choice for your next range trip for plinking or self-defense training. Featuring new brass casings and 95-grain full metal jacket profiles, this 380 ammo has proven to be a reliable and economical choice for trigger time. Each round of this 380 auto ammunition has a boxer primer and the casings are loaded with clean-burning powder. Remember, pretty much all bulk ammo ships for free here at AmmoMan.com. Spend $99 on any bulk 380 ammo and you'll get shipping for free. Don't get gouged on crazy shipping costs, come to the AmmoMan.com and know the price you see is the price you pay!